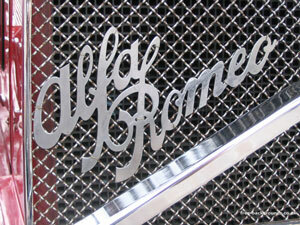 This is the badge on a classic Alfa Romeo 1750 Spider, built in 1929 in Turin, where this photo was taken. In a square in Turin, the Automobilismo Storico Museo Alfa Romeo had a display of several Alfa's from various parts of the company's history. This was one of the older cars. Turin is famous also for Fiat (another car manufacturer), the Turin Shroud (a holy relic), the recent Winter Olympics, and of course for being the location of the famous car chase in The Italian Job with Michael Caine.